Disco lighting hire for Southampton, Romsey, Winchester, Fareham, Eastleigh, Chandlers Ford, Totton, Lymington, Lyndhurst, Southsea, Lee On Solent, The Waterside, Hampshire, South Wilts, Ringwood, Fordingbridge and New Forest area. Whether you're holding a party for 6 children, 35 teenagers, or a wedding reception for 150 guests we have the right disco lighting for you. The KAM Party bar is a set of 4 LED lights that can each make any colour. 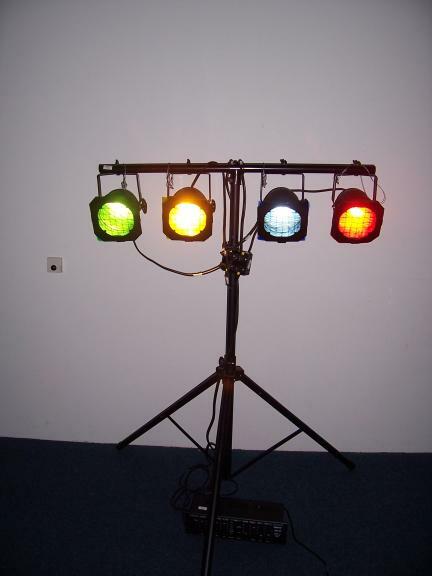 The set comprises stand and light bar complete with foot controller making it ideal for discos, solo singers or small bands. 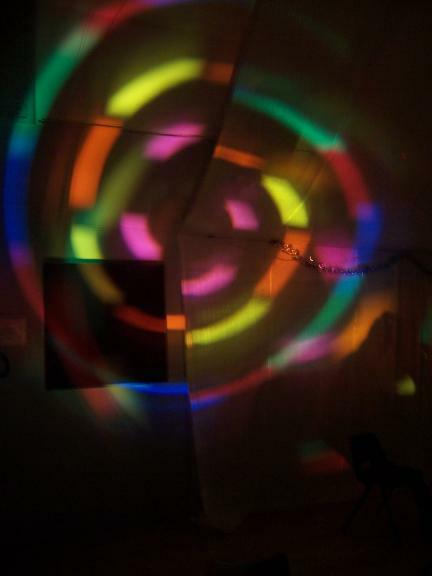 Lights can be set to constant colour or programmed to respond to sound. Comes in 2 easy to carry bags. Our floor-standing lighting package for parties comprises the Dual-Gem (including optional strobe) (left), blaze (bottom left) and Volta (bottom right). The Blaze produces a wheel of rotating coloured segments and, through a sound sensitive mirror, moves around the room. 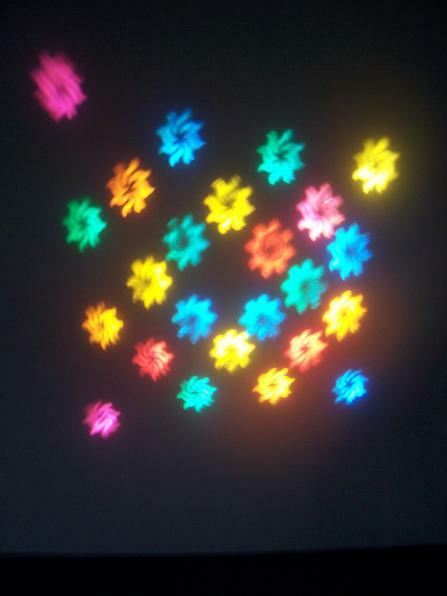 The Volta is a projector that sits on the floor and produces a pattern of rotating changing shapes. These three lights come in bags and can easily fit in the boot of a small car. Ideal for weddings, and parties for children, adults, and teenagers. Our Radius (bottom) sends multi-coloured patterns across the room, whilst the Moonflower (left) has a rotating pattern of different colours. The laser makes green and red sweeping patterns. Ideal for mounting on tee bar and pointing at ceilings or walls. (Health and safety guidance for lasers is that they should be mounted 1m above head-height). Ideal for weddings, and parties for children, adults, and teenagers. This light unit comes in its own case and can be fitted onto stand. It has four transparent heads that project coloured circle patterns. Easily fits in the back of a small car. Ideal for weddings, and parties for children, adults, and teenagers. See Youtube video of The 4Play in action underneath. We have a set of up to 8 PAR56 uplighters that can be set to many different colours. Each light comes on a stand with mains cable. Two tee bars each with 4 PAR 56 lamps. 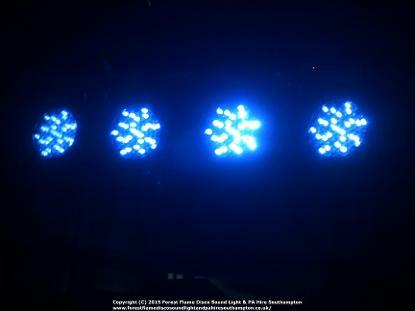 These lights can be used as white light for stage use and are controlled by a 4 channel dimmer controller. They can also be used with coloured gels giving coloured floodlighting. Ideal for band lighting. Ideal for larger venues giving a higher level of illumination. The large controller changes through many different light-flashing combinations. Comes in a large case needing van or estate car to transport. 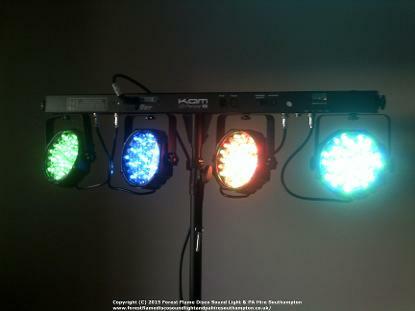 Ideal for when you need plenty of coloured lighting; Good for weddings, and parties for children, adults, and teenagers. We have one 200w floodlight on stand, and pair of 200w floodlights on stand plus additional heads that can be fitted on tee bar, complete with 16A exterior cables (1x7m), (1x23m) (1 x 18m) and x2 3 way splitters available for exterior lighting. This is ideal for situations where customers have parties in the garden or field and need extra lighting for guests to see where they are going at night time. If you can't see what you are looking for, give us a ring, we have other equipment available too!